As I posted a few days ago, our daughter’s, that we just moved 3-1/2 hours away to Dallas, car broke down. We had a feeling it was the battery and we had planned on coming up this weekend to fix it, but Harold’s work told him that even though it was his only weekend off for the whole month, he couldn’t take it. So as soon as we got paid we sent Holly the money to buy a new battery. She got some of her friends to help her go get a new in and get it in and she reported that everything was fine. Till Friday afternoon. We get a call about 3pm and Holly was sitting in the side if the road about a mile from the house, car dead! Well, work or no work we couldn’t leave our baby girl stranded, so we had her call a friend and take her to work while we loaded up dad’s tools that he thought he night need and headed out. One of the cars at the hotel where we were staying. Saturday I got up at 4:30am to go pick up Holly to get her to work. Then after daylight dad & I went to see what was wrong with her car. As soon as dad opened the hood the look on his face told me someone had screwed something up. Her friends meant well trying to help her, but it was very apparent none of them, including Holly, had a clue. First off she had the wrong size battery in. And because it was to big it was jammed up to the alternator fan. The cables were not attached to the posts and the battery cables, because of the wrong size battery, had gotten shoved up into the alternator fan and the blades of the fan had chewed through the protective coverings and into the bare wires. We were so lucking it died before it caught fire. Dad was able to rig it back together temporarily so we could get it the mile back to her house and start making a list of parts we needed. Once we had our list together we made a run to the nearest O’Reilly Auto Parts store, which was about 20 miles away. We ended up going to 2 stores to finish getting all the parts and new battery, cables, terminals, etc. by the time we were done it was time to pick Holly up from work and have some lunch. After lunch we headed back to Holly’s to get to work on her car. One of Holly’s friends was there and he got right outside with dad and helped him get everything fixed back up. They got all new cables and terminals put in. Secured the new battery & cables so it wouldn’t slide around or bump the alternator. Thank goodness it didn’t mess up the alternator as we just replaced that a month ago. (Of course I suggested to dad back when we replaced the alternator to go ahead and put in a new battery, cables & clamps & secure it as it looked like it needed to be done & I didn’t want her to get all the way to Dallas and get stuck :/ hmmm maybe someone should listen time a little more often). After dad got her engine running good again he and Holly’s friend checked all her brakes and tires to make sure she was doing good. So she is up & rolling again. After we got all cleaned up we were talking to Holly’s best friend and roommate and she confessed when we asked her how her car was doing, that her car had been acting funny & stalling out in her. It’s a good thing we planned on staying two nights, after breakfast this morning dad is going to check out her car and see if we can’t get her running good again. So it has been a busy but productive weekend. And I’m just so thankful my husband knows enough to keep all our vehicles running. 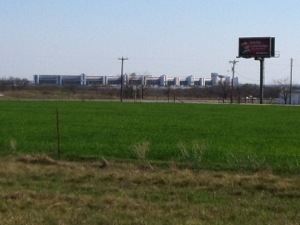 I took this picture of The Texas Motor Speedway from Holly’s front yard. Yep she is that close. 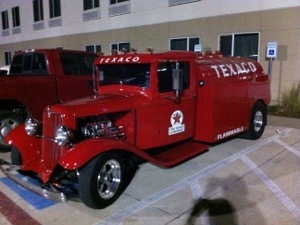 This entry was posted in Blog and tagged Dallas, Holly, repairs, Texas. Bookmark the permalink.